Protect your laptop and your gear with a comfortable, organized backpack for wherever your day may take you. 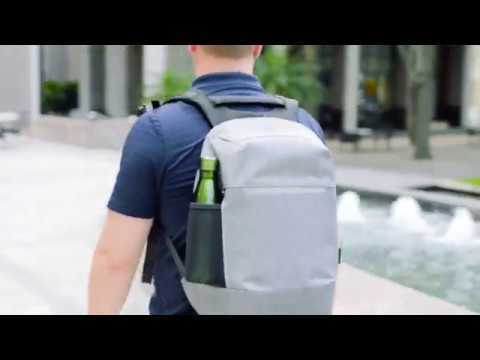 Sleek and lightweight with understated style, the Targus 12” - 15.6” CityLite Pro Security Backpack protects your laptop and provides amped up security – for whatever your day has in store. Intelligent features deliver added protection for you, your data, and your personal effects. The streamlined front design is free from pockets to guard against theft. Stash your phone with confidence in the soft-lined top pocket with back-facing zipper. Other valuables rest safe and sound in the hidden lumbar pocket. Your laptop travels in secure style thanks to lockable zipper pulls, while the RFID-blocking compartment helps safeguard your data. Your personal safety is enhanced by a front reflective strip and integrated, easy-access panic whistle. Dual water bottle/umbrella pockets, padded shoulder straps, and air mesh back panel keep you comfortable on the go. The ruggedized, weather-resistant base guards against dampness and provides structural stability for tip-resistant, standup good looks. Rounding out the style, the smooth, heathered material resists fading, stains, and wetness. Thwart would-be thieves with smart design. We've eliminated temptation with a minimalist, pocket-free front and strategically-placed pockets for your valuables. Keep your phone safely at hand in the back-facing top zip pocket. Your wallet and other prized possessions stash securely in the hidden back-panel zip pouch. And your laptop? Its compartment can only be opened from the back, keeping it safe and sound while the pack is on your back. Intelligent features like an RFID-blocking data-protection pocket amp up security and safety. Personal safety add-ons include a reflective strip for enhanced nighttime visibility and a personal panic whistle built into the sternum strap. Ergonomic contoured shoulder straps and stabilizing sternum strap safeguard against muscle strain. The ruggedized base is crafted from weather-resistant material to guard against dampness and delivers structural stability that keeps this pack standing tall when you set it down.